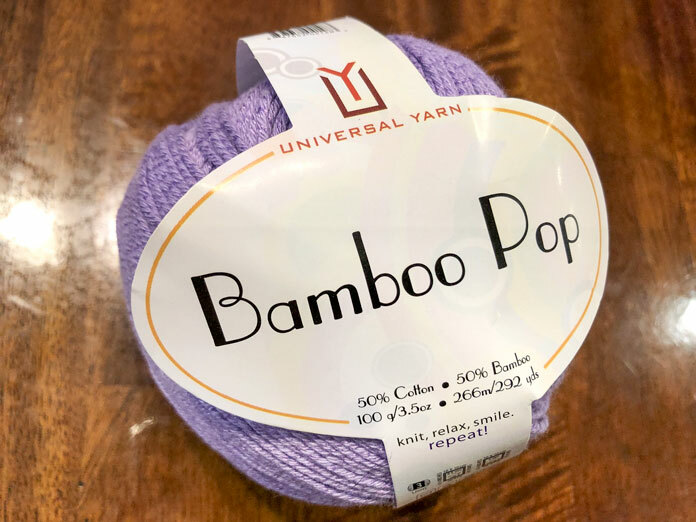 Yesterday I went over the waffle stitch and how it’s a more subtle stitch knit up in Bamboo Pop yarn. 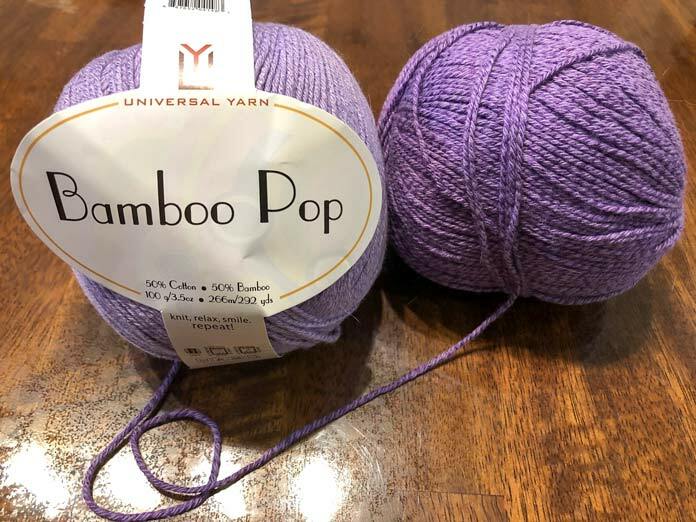 Today I’ll talk about a stitch that Bamboo Pop does really well, lace! The Ocean Lace stitch from Melissa Leapman’s book The Knit Stitch Pattern Handbook. 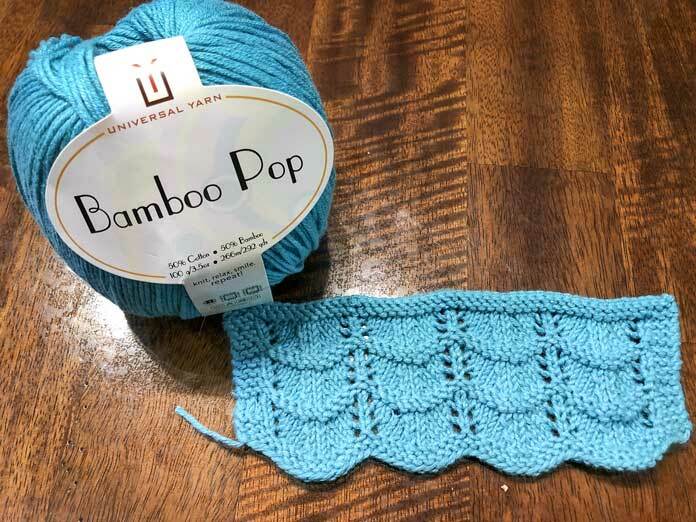 I still cannot believe how well Bamboo Pop shows off lace stitches. When knitting a garment in a lace stitch you really want the focus to be on the stitches. Bamboo Pop is like finding the perfect frame for a piece of art. Ocean lace stitch in the color Turquoise. It really reminds me of the ocean! At a knitting conference, yes they exist, I took a class on Japanese lace knitting. It was fascinating because it would take the simplest stitches, put them together, and make them into one cohesive garment. It looked like the best possible way to make baby blankets, or afghans. Any large flat piece of knitting that you need to add interest to. I was apprehensive about it getting really complicated and becoming a slow and dreaded chore to knit. However, all the stitches were easy to execute and memorize. My eyes were opened to how amazing lace can be and how simple you can make it! The light colors really make lace stand out. Since I did pay for this book and I highly doubt the author would thank me for giving away the secret sauce of this stitch I’ll suggest you grab the book from a bookstore or your local library. What I can tell you is the lace pattern is only one row repeated. The pattern has a total of 8 rows, but the actual lace is the same every time. The lace is fairly simple, made of yarn overs and SSK or K2TOG. With Bamboo Pop, you’ll want to be very careful with your K2TOG and SSK. Those two stitches are either left leaning or right leaning. In this yarn, it will be very apparent if you’ve mixed up your right and left. If you look closely you can see the striations in the yarn to add more texture to your garment. If you’re looking to make a lace garment I would highly suggest picking up a ‘stitchionary’ to look at the lace stitches. If you’ve never knitted lace and are concerned about starting with a baby blanket try knitting some lace swatches. After you’re finished you can either rip them out or use them as dish cloths. Cotton is a go-to fiber for dishcloths, and while these might be some particularly luxurious dishcloths, you will definitely know how you like that lace stitch.